Chapter 1: Foundation -- An introduction to paper-cloth Understand the phenomenon of paper-cloth and learn how to make the foundation. Available as a book (see Amazon above) or downloadable ebook from the Interweave Store. This book is chock-a-block FULL of amazing mixed media techniques. I like the way Kelli incorporates techniques as well as projects to demonstrate the use of paper cloth. It's a great reference book and what you learn can be applied to other art besides paper cloth. Beginner or old pro artists will appreciate having this book in their personal library. Frankly I think that this book deserves 6 stars, it's THAT good! I'm off to the store to pick up some white paint pens... read the book to find out why. :-) Thanks for the inspiration Kelli! This book is an excellent inspiration. I got so many ideas from it and couldn't wait to start my own projects. Now that I've done a couple, I realize how invaluable the book has become. The night this book arrived, I wound up at the hospital with my daughter in anaphylactic shock. There is not a better place for one to get intimately acquainted with a book than the local ER. In the long hours after knowing she would be ok and actually going home, this book provided us with something to do - an excellent way to divert our attention, giving us something fun to focus on. Oh - and it definitely provided me with a link to sanity. My daughter, who just turned 10, is a mixed media artist in training - but you can just call her the Princess. She loves all things mixed media, which I'm sure has nothing to do with her extreme immersion in the subject area since birth. Just because I eat, breathe, and dream art, does not mean she was destined to do the same. 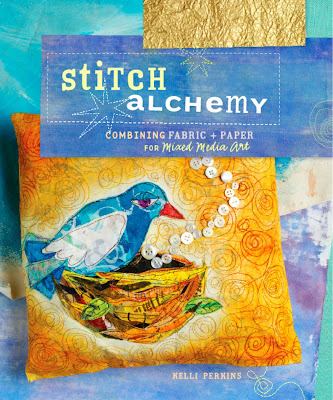 The great thing about Stitch Alchemy? It appeals to a wide audience - she and I both truly enjoyed it. There are several books on the market with [many] similar techniques, but what sets this book apart is the creatively unique way Kelli lays things out. 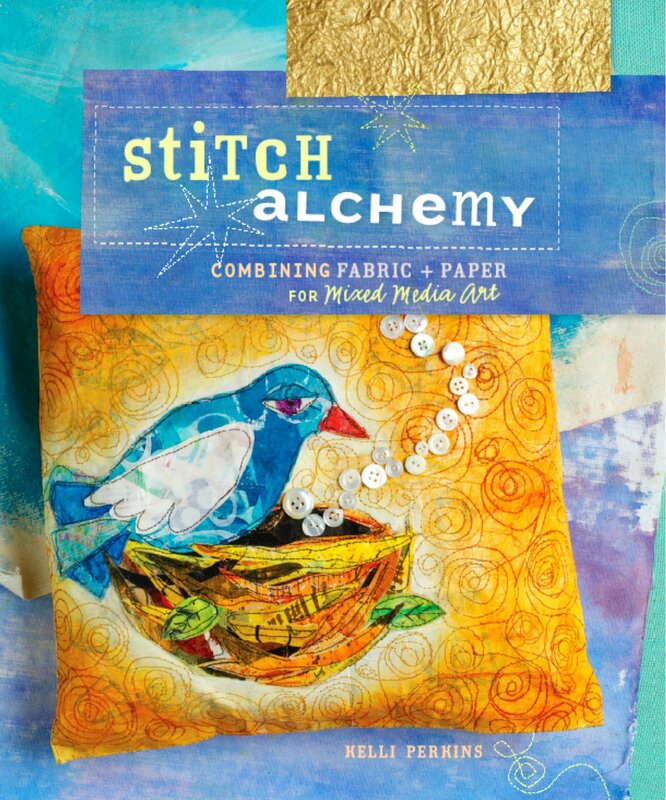 Although I own many books on fabric, fiber, painting, polymer clay, art journaling, mixed media, etc - I feel there are several new and fun projects in this book to tackle. The pictures alone are worth the price of the book - there are many wonderful close-ups full of extreme color and Kelli's great attention to detail. Next to each picture are thorough instructions, giving you the feeling that Kelli is standing next to you, anxiously leading you by the hand. You can't help but feel her creative excitement as she pulls you from one fun project to the next. For example, the whimsical Love Dolls on page 91 are begging to be made with your own style and flair. I can't recommend this book highly enough. It isn't something you need to read from beginning to end - as long as you have a grasp on the materials, flip through the book and pick out what appeals most at the moment. This is the perfect book to throw in your bag and look at while you're waiting for appointments, to read as the kids go to soccer practice, or gawk at while spending an eternity at the ER. (I'm guessing.) This book will make you relish waiting - and you will actually want to drive the carpool to dance class - so you can spend time investigating all the fun encompassed in the 135 pages. Once you've thoroughly gone through everything and the binding is bent and broken, follow reviewer Katie B's advice and get it spiral bound. You'll be far too busy contemplating all the inspiration and ideas, to hold this book open while you sew, paint, draw, glue, and bead with the reckless abandon of an artistic mad woman. This is a great book. It's so full...so bursting with ideas, you might just need to put a lock on it to keep it from continually popping open, knocking everything off the table around it. Magazine articles only hinted at the technique of "combining fabric and paper for mixed-media art". never giving me enough information to figure out how-to, let alone understand why you would even want to. but still i was hugely curious. curious enough to seek and find this book. i was not disappointed. i've been happily and industriously making paper-cloth this week in my studio after reading this book cover to cover. the first half of the book covers all the whys and hows in great depth and full color photos. techniques for embellishing paper-cloth sheets have carry over into many other applications and have already sparked new and exciting creative results for me. so what the heck to do with paper-cloth?! in the second half of the book, the author provides a dozen ways to "transform paper-cloth into wonderful works of art" including supply lists, directions and full color photos of the finished products (fabulous eye-candy!) a practical and delightful resource from start to finish. I LOVE this book! The first thing I did was take it to the local office supply store that has printing/copying services. For $4. they cut off the glued binding and replaced it with a spiral binding. Then the book was perfect! Too many "how to" books show you a picture, tell you what supplies were used to create the look but then skip the "how to" part! In this book, the photography is beautiful and the instructions complete and easy to follow. There are many techniques I will use in other mixed-media projects. I am going to save many hours of class time and many dollars in not having to purchase several resources to accomplish all that is in this one book. I agree with one of the other reviewers, if it had been possible I would have rated this with more than five stars. What a treasure! In Stitch Alchemy I have a favorite page for my visual pleasure and that is page 104. For me this page represents the "Bountiful Inspiration pick-me-up" (chapter title on pg 105) that fills the whole book. I see the words, "inspire, paint, weave, speak", and quotes by Charles Dickens and Charles Baudelaire which are truly inspiring. I suggest that if you are considering this book, and you like mixed-media art, just go for it. It is most enjoyable.